This is really a two-part editorial. In a bit, I'm going to be asking you for money again -- it's time for our semi-annual fund drive, and throughout the month of June we'll be raising money to help support the magazine. But first, I'd like to talk about awards, and what it means to try to be the best. Some of you may remember my first editorial here, where I talked a little about being born Sri Lankan, and raised as a South Asian in America. You've probably run into stereotypes of Asian culture that say we're all hyper-intellectual, achievement-oriented types. And while those are certainly stereotypes, and there are plenty of Asians who aren't particularly achievement-oriented, I have to admit that my own family is pretty classically Asian in that regard. I was a bright kid, at a not very difficult Catholic grammar school; it was easy for me to do well there. When I brought home report cards as a kid, my mom would point to the A-'s and ask why they weren't A's. When I turned into a slightly sullen teenager, my parents fretted over the corresponding drop in my grades (to B's and occasional C's), and the comment that showed up on every report card, "Does not live up to her potential." I got to hate that phrase. And when I got my first F ever (in college, in calculus), I spent days too scared to tell them. I made my then-boyfriend hold my hand when I finally called them. I'm not sure why it seemed so important, so scary. My parents certainly didn't yell at me about that F; they trusted that I was doing the best I could at the time, and hoped that eventually, someday, I'd live up to my potential. And in the years after college, when I was working too many temp jobs and becoming deeply frustrated with myself, it wasn't them telling me I wasn't doing well enough -- it was me. I was the one who craved the success, the praise, the awards. Maybe it was in part my upbringing that conditioned me to desire that so badly . . . but I think it was mostly just being me, and being human. Human beings want to be liked; we want to have our hard work recognized. We want to excel, if we can, and show everyone else how it ought to be done. We want to be the best, and no matter how small or large the mountain we're climbing, it gives us a deep satisfaction when we finally know that we've achieved the highest height. You can imagine, then, how delighted all of us at Strange Horizons were when we learned that we'd made the Hugo Award ballot for Best Website. If you read Greg Beatty's fine awards articles a few months ago, you learned that the Hugo Award is the award speculative fiction readers give to the work they love; the stories and art that move them, that stay with them over the course of a year. In some ways, the Nebulas are more prestigious -- those are the awards given by the writers, and often reflect high literary merit. But the Hugo Awards are given by the fans -- they're love letters, from readers to writers, from art-lovers to artists. As someone who grew up reading science fiction and fantasy, who fell in love with those books and characters over and over and over again, I believe the Hugo Awards serve as a tremendous reflection of what is best in the speculative fiction world. Being nominated for that award -- well, it just thrilled me, and I want to take this space to thank each and every one of you who took the time to nominate us, to tell your friends about us, to donate time or money to supporting this magazine. Thank you. That brings us to part two, of course. 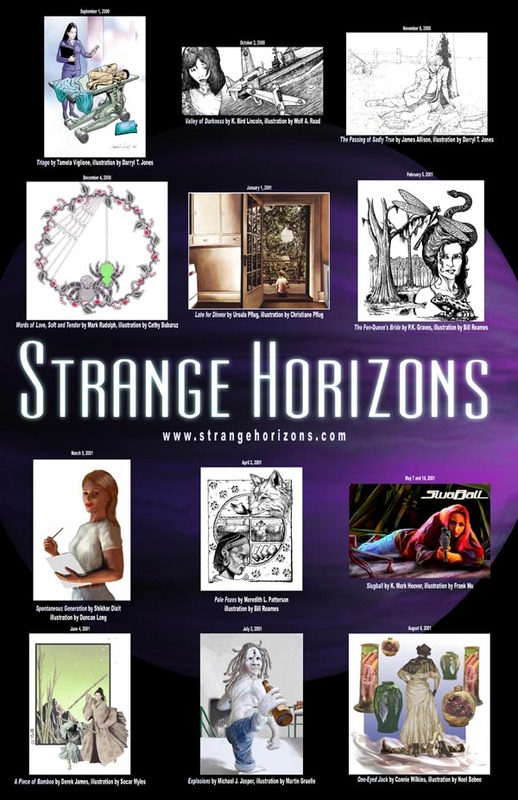 As you know, Strange Horizons is a volunteer-staffed non-profit. It's run by about thirty people who put in quite a lot of time to bring you what I think is one of the best magazines in speculative fiction today. The magazine costs about $15,000 annually -- that money goes to Web site hosting and to the professional authors and artists who contribute fiction, poetry, artwork, articles, reviews, and music to the magazine. Last December we were delighted to raise over $1000 in our fund drive; much of that money came from small contributions, of $10 or $20. This June, we're going to try to do that again -- our goal is to raise another $1000. If you stop by our donor page, you can learn more about how to donate money or otherwise support the magazine, including information on all the great prizes available to donors. (We have some fabulous posters of our first year illustrations, for example, and some terrific books by some of our authors. Not to mention the cool black mugs, not available in stores.) Strange Horizons wouldn't be possible without the support of its readers -- that's you. Please do stop by and consider contributing to our future. We don't know if we'll actually win the Hugo Award for Best Website; we have some stiff competition in this very wide world of speculative fiction. But for a magazine that's only a year-and-a-half old (not even a toddler yet! ), we're honestly just honored and delighted to be nominated. We hope that you think we're living up to our potential so far . . . and that you stay with us in the years to come, as we constantly strive to improve. Awards serve to motivate us, to show us what we've done, and to remind us that no matter how well we're doing, we can always get better. Please help us get better; help us become the best!